There is one subject that has taken the plastering world by storm – plastic over steel! The new generation of plastic trowels is proving to create massive discussions among plasterers which is why we’re going to cover a new subject. This is the Refina Plaziflex review. One of the most influential movers in the world of plastic trowels, the Refina Plaziflex is getting a lot of attention. From the good to the bad, it has to be said that this little bad boy is creating a stir. Giving great results for many, we are going to give an honest review for the plasterers who are looking for a change. Is this the new way to plaster? Will plastic trowels prove to become the future? I’m not too sure because it isn’t all fun and games. Half the world loves Plastic trowels whilst the other half seems to despise them. I know a lot of plasterers who think that plastic trowels are pointless. Where will you stand, are you going to ditch you steel Trowel? Ok, let’s not get too carried away, let’s talk about the Trowel, discuss the pros and cons and decide whether this plastic Trowel is worth getting! Don’t throw your steel away yet, it might not be worth it! What Is The Refina Plaziflex? The Refina Plaziflex comes in 6 different sizes: 12″, 14″, 16″, 18″, 20″, and 24″. However, after the sizes, it starts to get a little confusing (probably unnecessarily to be fair)! There are 2 types of Refina Plaziflex Trowels. You have the “flex back” which is the flexible Trowel that is solely designed for finishing which only comes in one 1mm thickness. Then you have the flat back sleeve (which is blue rather than black), which has 2 thicknesses. You have the 1.5mm flat back which is semi-flexible and then the 2mm sleeve which is semi-rigid. This is designed for applying the plaster with. Yep, a plastic Trowel that you can lay on with! That way you have 3 different sleeves for 3 different purposes. Is it a great idea or just a money making scheme? Who knows, all I do know is this: the logistics are over with now let’s get to the good bit! Let’s talk weather this little devil is any good! This is a great Trowel. It is nice to hold, comfortable to use and takes all the pressure off your joints. It’s a little gem and it’s definitely worth trying. It really does give a lovely, matt finish that provides a uniform complexion. I must admit, it can take a little bit of getting used to but it’s worth the trial and error. It’s also good for the decorators because it creates a Matt finish without the shine. I loved 1.5mm flatback Refina Plaziflex sleeve – it was a dream to use! It reduces watermarks and makes the plaster glow. I also love the fact that you can change the sleeves with ease. It means you can have 6 different trowels whilst saving space. Great idea. When used correctly it can be a really good tool! Nice to use, gives a brilliant finish and reduces your chances on tennis elbow. However, it does have a few drawbacks. They are extremely weak and they get damaged soooooo easily. If you plaster over corner beads then you will scratch the plastic which damages the Trowel! I have got away with it before but chances are that beads will damage the Trowel. You can sand the knicks out but it just takes time. However, this is my only concern. For full walls or ceilings without any beads or reveals it’s Perfect. For anything that involves beads, I’d use the Refina Superflex. This is a great Trowel. The Refina Plaziflex is definitely a tool worthy of being in your arsenal of plastering trowels and is definitely a Trowel that gives solid results. The finish it gives is amazing, it really is. I actually prefer the finish to the Refina Plaziflex more than my Marshalltown and Refina Superflex. It is a great tool to use and feels so smooth when finishing. I also love the fact that you can lay on with this Trowel. It’s so diversified. It’s just too weak on beads. They do scratch and you do have to look after the plastic blades. You can’t finish on reveals which means getting another Trowel. That bit I hate – why get another Trowel when steel can do the job all the way through? However, you can’t doubt it – the Refina Plaziflex is monumental. Great Trowel and great value. Whether plastic beats steel, that’s for another day. However, it is a good Trowel that I personally loved using. Will you give plastic a go and see if the Refina Plaziflex is worth trying? Let me know what you think and join the discussion by leaving your comments below. Thanks for reading the Refina Plaziflex review. 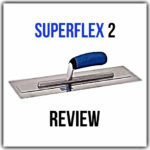 If you found this useful read our review on the Refina Superflex, one of my best trowels – may the battle between plastic and steel continue! With 10 years of experience in plastering, I created Plastering For Beginners, a website that shows you how to start plastering. I also love playing the drums, producing music and when I get the chance, I love visiting the lovely fields of Glastonbury to get the music fix I need for the year.